What does it mean to make your patients your top priority? Here are the logistics of how I get it done. I’ve built my practice on the relationships I’ve forged with my patients. My solo practice caters almost solely to patients who pay out-of-pocket for my services. Accordingly, I strive to maintain a practice in which I spend time conversing with each patient, discussing what each needs in eyewear and eye health treatment to lead their best life. I accept Horizon Blue Cross Blue Shield (BCBS) and Medicare, but the majority of my patients pay for my services out of pocket. About 40 percent of my patients have BCBS and Medicare, and the remaining 60 percent are fee-for-service patients. Last week the office manager from my dentist’s office was in for her annual eye examination. While I brought her out to the reception area to allow her eyes to dilate, I made her some peppermint hot chocolate and put on her favorite music, and she said: “Do you know what I love the most about coming to your office? I feel so pampered.” I then told her that I had observed that, when given a choice between coffee, tea, water and hot chocolate, my coolest, most vibrant patients always choose hot chocolate. I told this to another patient last Christmas, and she mailed me a Williams & Sonoma tin of gourmet hot chocolate. Those kinds of interactions and conversations with my patients are what lets patients know they are my top priority, and allows me to build long-lasting relationships with them. Making patients a top priority begins by obtaining important information from them. It means taking a thorough medical, ophthalmic and social history. This allows me to tailor the patient’s healthcare and eyecare regimen to their genetics and lifestyle. It facilitates the creation of a plan to partner with my patient to preserve their ocular, visual and systemic health. For example, for a patient with a family history of macular degeneration, I might recommend the nutraceutical supplements we sell in our office with vitamins that are known to be beneficial to eye health, and I would give them guidance on foods they can eat, and lifestyle changes they can make, like quitting smoking, to decrease their chances of developing the disease. Dr. Boname uses her web site to let patients know that their needs come first, meaning she takes time to speak extensively with each patient, getting to know the individual needs of each patient. 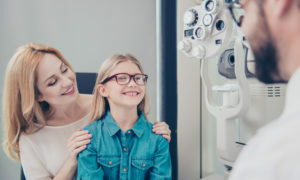 For me this means allocating 30-40 minutes per patient for a comprehensive eye examination, and electing to take no managed care. I am in the office five days a week (approximately 55 hours/week), and I am available for emergencies when the office is closed. If I am traveling, I make arrangements with colleagues in optometry and ophthalmology to see my patients in my absence. But I always reach out to my patients via phone or e-mail to let them know I am aware of their emergency and care about their eyes and them. My greatest expense is my time. Time is money, but patients appreciate my care, seek it out, often return for it if they decide to try another doctor, and recommend me to their family and friends. 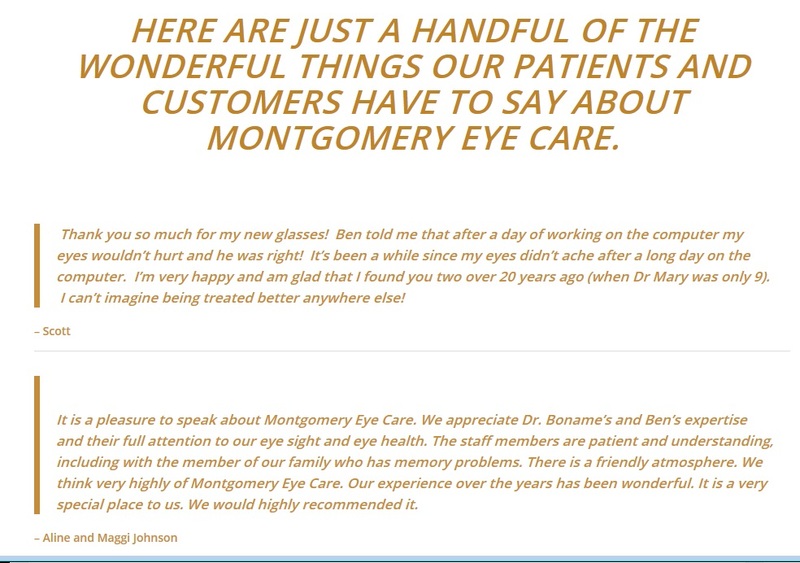 Dr. Boname shows off patient testimonials on her web site, so prospective patients know the kind of care they will get in her office. Editor’s note: Be sure to get a signed HIPAA marketing authorization form from each patient whose testimonial you feature in any form, written or on video. Technologically up-to-date instrumentation allows you to provide the best care for patients, enabling you to gather the data you need to provide interpretation about the patient’s eye health needs. That is an essential part of putting patients first. I have been using electronic health records since 2007. At that time, I also purchased a refracting lane with an LCD chart, and a Kowa Digital Retinal Camera, which provides a concrete means of evaluating and monitoring retinal and optic nerve health. It is important to stay abreast of technology changes, and be informed of upcoming changes in software. 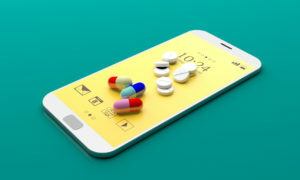 I voraciously read about new technologies and the latest in therapeutics for the care of my patients. My Epic 5100 Computerized Phoropter by Marco allows me to showcase in the press of a button the new subjective refraction versus the habitual correction. 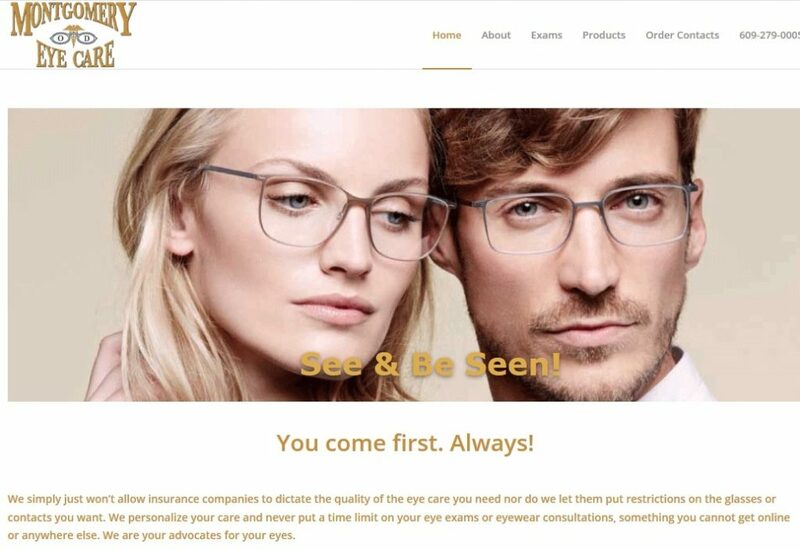 It makes it so much easier for patients to visualize the improvement in their best correct visual acuity that new prescription eyewear will bring. I believe that healthcare is a service-based entity, and that if you always treat patients the way you want to be treated (i.e. “The Golden Rule”), you can’t go wrong. For example, I know that when I am a patient, I want the doctor to patiently field my questions, and then thoroughly explain the diagnosis and treatment, and to do so in an empathetic way. So, I try to do that for each of my patients. I also am honest with my patients about the eyewear I do–and don’t–think they need. I never want my patients feeling like they are being pressured to buy products they don’t need because I know how that would make me feel. Patient testimonials and targeted social media ads, along with supporting local student athletes and organizations, are great ways of letting the local community know you are a doctor who prioritizes her patients, that you have made the necessary investments in your practice to serve them, and that you are committing to taking time to educate and converse with each patient. There are little, no- or low-cost things you can do to make the patient feel comfortable at your office. These include: selecting the Pandora station they prefer, making hot chocolate with little marshmallows or whipped cream, saying “thank you for choosing me as your eye doctor and for filling your Rx in my dispensary,” placing fresh flowers at the reception desk, a full candy dish and complimentary pens with your practice name and logo.